FOR $12,720 a night you can have a three-bedroom penthouse that accommodates six guests. The penthouse features a presidential-size sitting room and dining area, 3 bedrooms and 3 bathrooms, kitchenette, bar and wrap around balcony. It also includes complimentary in-room bar, internet access and a dedicated 24-hour Butler. 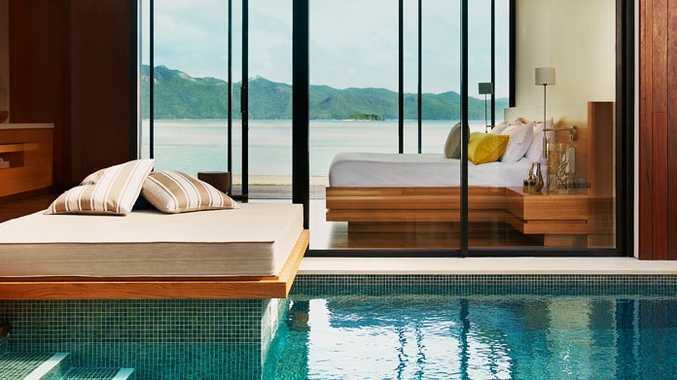 Some would want a lot more for their money but this is the price you pay for luxury at Hayman Island's new One&Only resort. The resort which will open to their first guests this morning has undergone an $80 million facelift. International casino and resort player Kerzner International Holdings took over the management of the Island last year. "I am thrilled to introduce One&Only to Hayman Island. It is the perfect destination for the first One&Only in Australia and I know the resort will be well received by our many loyal One&Only guests, as well as guests that have been enjoying Hayman for years," said Alan Leibman, CEO, Kerzner International. "My personal commitment is to make One&Only Hayman Island a 'must stay' for the well-travelled to explore the wonders of this magnificent destination." Hayman Island is located in the very heart of Australia's Great Barrier Reef, surrounded by an amazing natural ecosystem of pristine coral reef formations and diverse marine life. Showcasing the natural elements of the iconic location, One&Only will present a number of unique guest experiences, enhanced accommodations, new culinary options and signature One&Only service throughout the resort. The 294ha island was first developed by airline magnate Reg Ansett in the 1950s. It underwent a $300 million redevelopment in the 1980s before being bought by Mulpha nine years ago. The Great Barrier Reef property is One&Only's first resort in Australia, with Mulpha retaining full ownership of the island.